As genetically modified organisms become more prevalent, so do protests against them. In just the past few months, French activists have uprooted GM vines at a research center, Spanish activists have destroyed experimental GM Maize crops, and Haitian farmers have burned Monsanto seeds. But are these destructive direct actions the best form of protest against the rising corporate control of the food system and its very genetic material? My good friend Zack Denfeld, a self-described information ecologist and lecturer at Pacific Northwest College of Art, is developing a creative form of resistance through his Center for Genomic Gastronomy. Taking a somewhat Yes Men-inspired, tongue-in-cheek approach, Zack is extending the logic of GMO’s to their unnatural conclusion by putting them in situations their inventor’s never considered. In his first experiment with the Center for Genomic Gastronomy, Zack made sushi rolls out of GloFish—a patented brand of GM fluorescent zebrafish, which is publicly available as a pet. The idea, as Zack explains in the above video, is to give people the opportunity to beta test transgenic fish before the FDA approves GM salmon—soon to be the first genetically-engineered animal for human consumption. We’ve made a number of recipes with these [GloFish], so you don’t have to wait for approval from the government to try these transgenic fish if you’re interested. What’s really interesting about this is they’ve been existing in science labs and all of a sudden one guy had a really interesting market strategy, which was to make them available to the public. And we think that’s really innovative and we’re building on his innovation by cooking with them. I don’t know how happy he is about that, but I want to ask you how happy you are with these recipes. If you’re all for transgenic foods, you’ll love my sushi rolls. 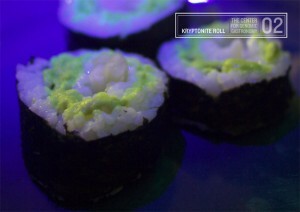 If you don’t like my glowing sushi rolls you may want to tell the US FDA to hold off on that transgenic salmon. The decision is up to you. You are no longer passive. You are active in this process. 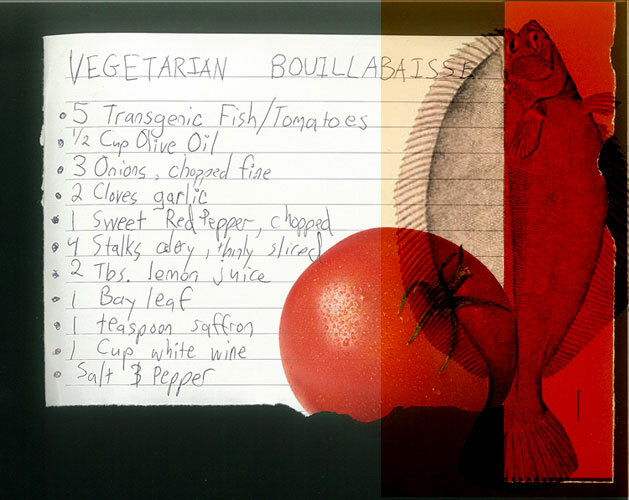 In another experiment—this time going after the secret nature of GM research—Zack created a recipe called Vegetarian Bouillabaisse. It calls for something known as the Fish Tomato—a somewhat mythical GM design that involves a tomato being inserted with a cold-tolerant gene from a fish. In our research we found documents that proved this very much did exist. This brings up really important questions. Is the Fish Tomato vegetarian? Is it an animal? Is it a plant? We don’t know. But it’s important to eat this, taste this and find out. The problem is we can’t because both the genome and the data that came out of the research vanished in a cloud of confidential business information and corporate appropriation. The issue here is that if we don’t have the data we’re not doing science. Scient is about verifiability and repeatability. So we need to stop calling the people who don’t give us data scientists. They’re not scientists. They’re just biohackers like me and you. Until they make their data public we should not call them scientists. When I spoke with Zack about his work, he stressed the imporance of being able to reach these so-called scientists with our concerns. They are people after all. And they can be reasoned with and persuaded to reconsider their actions. But when their work is challenged destructively, they, like most people, respond with indifference. They just write off the protesters. If however, the protests are targeted at discrediting their work and exposing their inability to anticipate its consequences, they are far more willing to listen. Having scientists on our side, instead of on the corporation’s side, may be the key to preserving control over our food systems. With that said, I don’t quite get the hysteria behind GMO food. I can respect the antipathy towards the secretive nature of the research and the affects of gene patents – but human beings have been genetically modifying food for centuries and there’s little scientific evidence that implies that GMO food is dangerous for consumption. Cross-breeding and selective breeding have been improving our food systems since we were able to domesticate plants. With almost 7 billion people in the world – and a limited amount of arable land – we NEED to find ways (quick ways) to increase the efficiencies in crop yields. Genetic modification applies well understood scientific knowledge to merely speed up the process. What’s wrong with selecting genes that increase resistances to pests or climates or improve taste, lengthen shelf life, infuse more nutrients?